Many of you will know that I was recently in the Holy Land on a Pilgrimage. Seven days following in the footsteps of Christ from the synagogue at Capernaum to the Via Dolorosa had a significant impression. I learned, not for the first time, that it takes time to adjust to new surroundings and experiences, and to fully appreciate them for what they are, for what they offer. Paddy experienced this too when he visited the Abbey of St Wandrille de Fontanelle of the Benedictine order near Rouen. He wrote about this experience in the wonderfully concise “A Time to Keep Silence” published in 1957. This article by Debra Bendis briefly compares her recent experience with that of Paddy. 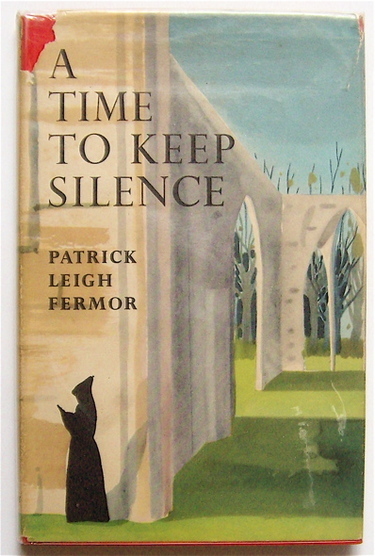 While on retreat recently, I picked up Patrick Leigh Fermor’s A Time to Keep Silence. I was making my own transition from noisy life and noisy mind to four days of retreat when I came upon Fermor’s description of his retreat at a French monastery in the ’50s. My adjustment process isn’t as difficult as Fermor’s. For one thing, I’m retreating close to home (and not close to Paris, as is Fermor); for another, I don’t find myself having to emerge from a “monsoon” caused by a drinking habit. (I sneak away from the monastery to find good coffee, but I have yet to sneak in a flask of Calvados.) In part because of his ignorance of monastic life and then his sudden immersion into it, Fermor’s is a humorous but accurate account of the transition. My first feelings in the monastery changed: I lost the sensation of circumambient and impending death, of being by mistake locked up in a catacomb. . . .The mood of dereliction persisted some time, a feeling of loneliness and flatness that always accompanies the transition from urban excess to a life of rustic solitude. . . .the desire for talk, movement and nervous expression that I had transported from Paris found, in this silent place, no response or foil, evoked no single echo; after miserably gesticulating for a while in a vacuum, it languished and finally died for lack of any stimulus or nourishment. This entry was posted in A Time to Keep Silence and tagged A Time to Keep Silence, Patrick Leigh Fermor on April 17, 2011 by proverbs6to10. Some years ago and inspired by PLF’s charming slim volume, I spent some days in a monastery in France’s North West. It was all well worth it and all part of the enchanting learning curve of getting to know him; as an author and human being. Please keep writing Paddy, even if its a 1951 model !